Remove the skin and seeds from the Kumato® and cut them into small pieces. 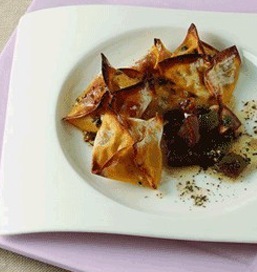 Fill the wonton sheets with the Kumato and bake at 250ºC for six minutes until they are crisp on the outside. Chop up the herbs, cut the avocado into small pieces and add the sesame oil. Serve the ravioli with the fresh herb vinaigrette.